Image caption Hannah Ellis: "Sometimes I worry if I'm ever going to cope with having a family"
Nobody likes being sick. But Hannah Ellis says her fear of vomiting is so intense that "chicken scares me" and she panics if friends or family fall ill. 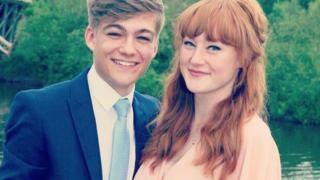 The 19-year-old from Sheffield has emetophobia, a condition affecting thousands people in the UK. My flatmates are probably wondering why I'm eating pasta and tomato sauce for the fourth evening in a row. It's not because I'm skint, the truth is that chicken or the thought of reheating food is terrifying. My phobia of vomiting - even the word churns my stomach - dictates nearly every aspect of my life. Being a university fresher is always nerve-wracking but for me it's been 10 times harder. Nights out are a struggle because I can't drink too much or look after my friends if they're unwell. If my boyfriend, friends or family get ill I don't think: "Are they OK?" My first thought is: "Oh God, am I going to get ill?" It makes me feel guilty. I used to be scared to eat at all in case I would throw up. Now, when I make a sandwich it has to be slightly toasted because I keep my bread in the freezer in case it goes mouldy. I'll bin anything I opened two days ago if it says "once opened eat within two days". It began at the age of 10 when I got food poisoning on a holiday to Egypt, but I've blocked that out now. I haven't been sick since. I was lucky because a family friend's daughter had it. She told my mum what it was, and that it was a thing with a name. Doctors I went to said I had anxiety but I'm not an anxious person, it's just sick that scares me. They sent me to counselling which didn't help, they just thought it was a deeper issue. I was hypnotised but that didn't work - maybe I'm too cynical. I've found my own way of dealing with it, trying not to think about it all day and getting on with my life. I'm a lot better than I used to be. I gave my flatmates the lowdown before I moved in and they're really considerate. It was really hard to make new friends at secondary school because I was scared to eat at people's houses and always had to pick the restaurant. Now I only ever panic when someone near me is contagiously sick, or when I actually feel sick. But sometimes I think, "Oh God, am I ever going to have a family?" because I can't bear the thought of morning sickness or my own children being ill.
My parents told me that when I have my own kids it'll feel different - so I'm clinging onto that. I'd love to be able to travel without being scared one day. I'd go to Thailand, but it's not a feasible option at the moment. What is emetophobia and how common is it? Emetophobes might restrict their diet, avoid eating out and even prevent pregnancy due to the fear of morning sickness. They may refuse to go to school or work if there is a sickness bug going around. "It's truly debilitating", explains Nicky Lidbetter, chief executive of charity, Anxiety UK. "I've known women who have not become mothers because of it." The number of UK sufferers is thought to be in the hundreds of thousands with around 80% of these being women. There are no exact figures due to lack of research and misdiagnosis. Anxiety UK, which receives around 15,000 inquiries a year to its telephone helpline, says around one in 20 callers report signs of emetophobia. Most are women, Ms Lidbetter says. "We think it's because women are more likely to fear the social ramifications of being sick." But "we don't have an accurate picture" of the phobia according to Alexandra Keyes of the Maudsley NHS Foundation Trust, a researcher in emetophobia at King's College London. "It's classified as an 'other' type phobia", says Ms Keyes. "This is unhelpful for clinicians, who may misdiagnose someone as having an eating disorder or OCD." Emetophobia usually emerges after someone has had a traumatic experience of vomiting, especially in childhood. Cognitive behavioural therapy (CBT) is the most common treatment for sufferers and is available on the NHS, says Ms Keyes. King's College London is trialling intensive sessions where sufferers are presented with "feared situations" - including sitting next to a hospital patient or visiting a restaurant where they do not know the hygiene rating. "We also make up concoctions of fake vomit and use role play to confront someone with a sick person," Ms Keyes adds. Hypnotherapy is another treatment option, but it is not typically available on the NHS. Ms Lidbetter says: "It really helps people relax and feel more in control." Sufferers can find out more about the condition, and meet like-minded people online. Resources include NHS Choices, Anxiety UK's emetophobia page, the Emetophobia.org forum and several Facebook groups.